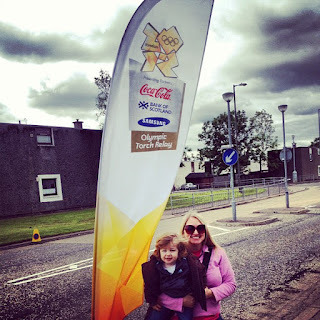 What I Wore Wednesday is a bit later than usual today because we took Blondie Boy to see the Olympic Torch Relay as it went through Cumbernauld. 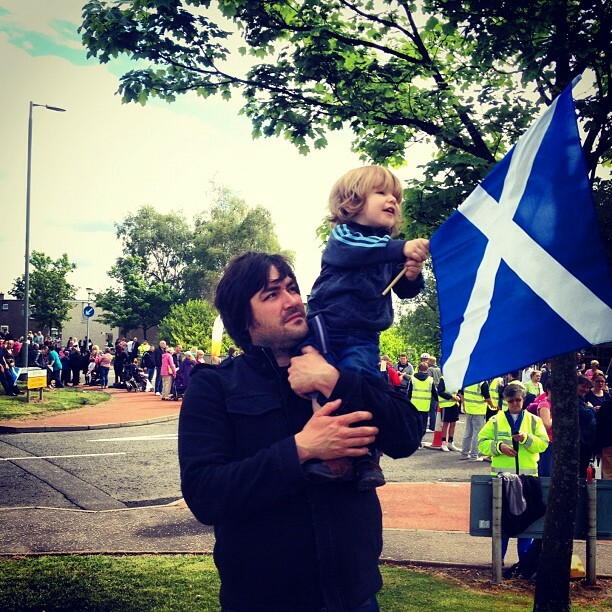 The torch went through Glasgow the end of last week but it was rainy and taking a two year old into the crowds did not seem like fun. Cumbernauld is only about 15 minutes from us so it worked out perfectly. Blondie Boy really had no idea what the Olympics are or what a torch relay is but we told him the Olympics were about sports and tried our best to tell him a man or woman would be running with fire. He then kept telling us a fire truck was coming. We knew the torch was coming soon when big Samsung, Coca-Cola and Bank of Scotland trucks rolled through. 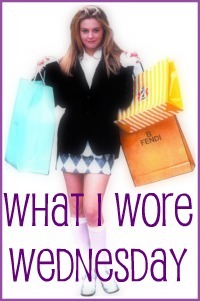 I know some people said they felt it was overly commercialized but not for us. They threw out some mini bottles of Coke but there wasn't any chanting about brands or anything. We were standing near one of the torch swap over points and if you know me you'll know what I did when I saw the next torch bearer standing nearby with a torch. It is times like this I'm glad I'm cheeky! I know Blondie Boy won't remember much of the torch relay but how cool is it that he got his picture taken with torch bearer Josh Gavin and the Olympic torch! I'm so glad we went because it really is a once in a life time experience. Are you doing anything for the Olympics? How have you explained them to your children? Thanks for hosting! Looks like you had fun! How exciting! I kept waiting for your WIWW to go up, thought you might be skipping this week! sounds awesome - thanks for hosting!! How fun! We only live about 3.5 hrs from Salt Lake and we are kicking ourselves that we didn't head down there to take part in the Olympics! Oh, that is so cool! I wish I could have been there. My husband cousin actually made it into the Olympics this year (Sam Hazewinkel) and will be wrestling August 8th, I think. So, we're making a big deal out of it with our kids! We were considering going to London so that we could watch him person, but it's just so darn expensive! Yeah, looks like fun! We went to the torch relay in Vancouver last year and the kids loved it. OMG what an amazing experience!!! So jealous!! The Olympics!!! 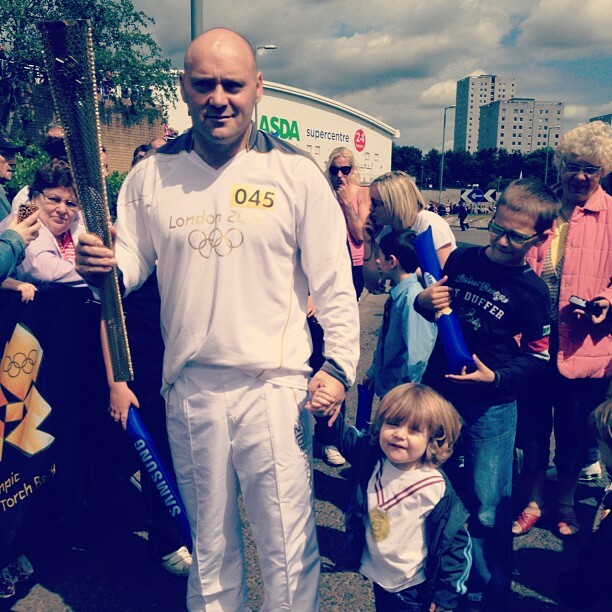 I looooove the Olympics, and so cool that you and your family got to experience part of the torch relay! So happy for you and your son that you got to visit this historical event! You both look adorable! awww, he is so darn cute. How cool that you got to take him to see that! And even if he doesn't remember it all, you'll have those cute pics to show him. That's such a cool thing to have done for him! Brilliant! That looks like such a fun experience! Wow, what a great time and experience! I have to say your son stole the show in your pictures. Sorry, he is such a doll. That is kind of how I thought! I don't expect him to remember but he can still say he went when he is older. Thanks! I was back and forth on going since he is so young but I'm glad we did! Our tickets just came in the mail today, too! I don't think they do a cross-country relay when the games are in the US do they? I will have to watch for him now! London is going to be crazy so we aren't going but there is Olympic football in Glasgow so we have tickets for that! I think the actual Olympics will be INSANE! I'm not touching London but we will go to the football in Glasgow. It was pretty cool and the torch bearers are all inspiring people. That is such an awesome story and I'm sure he will be grateful to you for having taken him!